How will Snapchat bounce back after the update nobody asked for? One reported goal of the update was to make the platform more user-friendly to a wider audience, that includes older users and greater geographic diversity. After going live, it didn’t take long for Snapchat to realize they rolled out a subpar update, as an online petition to reverse the redesign quickly garnered more than 1.2 million signatures. Let’s flashback to before the update when the Snapchat interface made sense. If you swiped to the left, you’d see snaps sent and received and to the right, stories that friends had posted. When you watched stories, there was a convenient auto-advance so you didn’t have to click between one and the next. When the January update came along (and wrecked everything) you would have to swipe left for a combination of snaps and stories crammed onto one screen organized by an algorithm as opposed to the more logical reverse-chronological order. A swipe to the right would deliver Discover stories, celebrity and influencer posts, along with other random story content. Scattering stories among user’s messages proved to be frustrating and confusing, and people just straight up weren’t dealing with it. Snap Inc. saw a subsequent 73% decline in user sentiment and its user base declined — along with its stock price. When the backlash to the update became impossible to ignore, Snap CEO Evan Spiegel responded by refusing to roll back the update. He explained that users would have to adjust to the new layout as kinks were gradually worked out. Despite the original resistance, Snapchat must have heard some concerns, because in the past few days they’ve come out with a revamped, re-redesign of their original update. The re-redesign makes us wonder if tweaks to the original update are going to be enough to regain the affection of those who pledged to ditch Snap for good after the January redesign. Many skeptics say that while necessary tweaks have been made to the platform, Snapchat has to make far great strides if they want their platform to be truly user-friendly. The latest version of the app features a swipe to the left to find messages sorted back in reverse-chronological order and stories, sorted by an algorithm, have been re-delegated to the right side. When it comes to how Snapchat is going to make a comeback and regain users and affinity, there are several suggestions floating around the webiverse. A popular idea among tech bloggers is to engineer a hybrid of all of its previous versions, incorporating more screens to avoid cramming confusing and unrelated content together where it never lived before. Harsher critics will say that Snapchat will never recover unless it reverts back to the original pre-January interface completely. It will be interesting to see how Snapchat’s story unfolds in the coming weeks as the re-design reaches broader audiences. 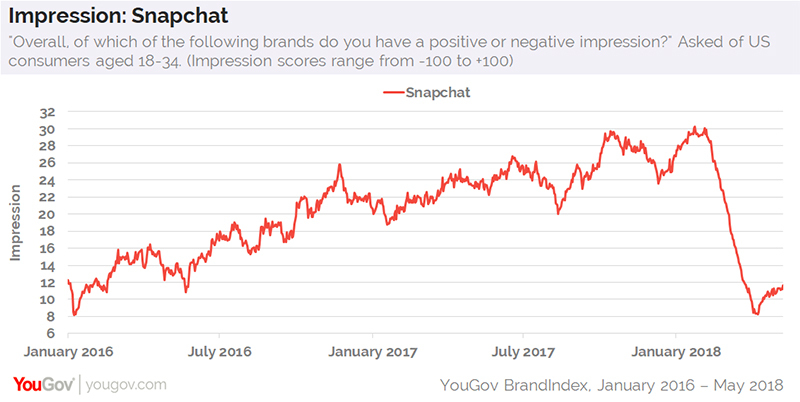 We’re rooting for Snap to bounce back, but the struggles they’re facing reminds brands that when trying to create solutions and optimize products for consumers, they can’t forget to listen to consumers and include them — especially when making decisions affecting them. It seems as though Snap ignored the initial interests of their consumers and sheepishly dodged criticism. What will it take for Snapchat (whose existence revolves around user-generated content) to create an interface that allows users to more seamlessly generate and view content?